Asmahan Simry, Palestinian citizen of Israel and human rights activist focused on the treatment of Palestinians, introduced her humanitarian technology organization to undergraduates on March 5th at the Slifka Center for Jewish Life at Yale. The organization is Comet-ME, an energy organization grounded in its goal of providing basic utilities to communities in the West Bank. 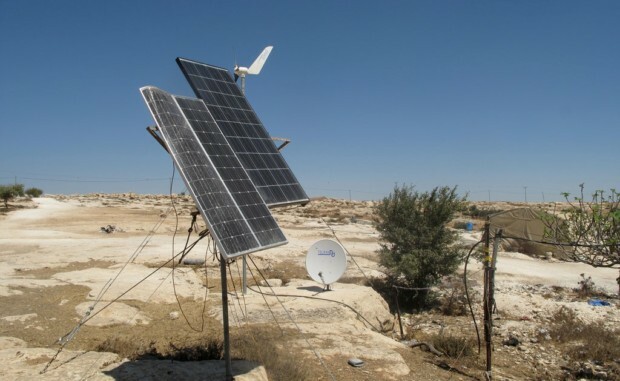 Comet-ME, an Israeli-Palestinian organization, began operations in 2007 with the goal of providing electricity to off-grid communities spread throughout the West Bank. In 2013, the organization expanded its work to provide water distribution services. The organization uses solar and wind energy to provide this infrastructure. 60 communities, about 6,000 individuals of a total 200,000 Palestinian inhabitants of the West Bank, have benefitted from their services. Comet-ME operates in the Israeli-Palestinian region, specifically rural areas of the West Bank without large Palestinian cities nearby. Known as Area C, these are areas of the West Bank under Israeli civilian and military control. In the communities Comet-ME serves, Bedouins live beside Palestinians, often leasing the Palestinian’s land after Israel expelled the Bedouins from their own homelands in the 1950s. Residents typically live in tents or caves. The primary source of income is from the wool and butter of their sheep and goats. Hours are spent doing chores that could be done much more efficiently with the help of electricity. Individuals travel far to find a space to recharge electronics. Many travel to access cisterns that hold collected rain to supply for their water needs. The limited access to unmonitored water, coupled with the residents’ inability to dispose of biological waste properly, creates severe health risk. When Comet-ME partners with a community, they install solar panels, wind turbines, and an energy center to store accumulated energy. They supply power to the tents and caves that make up the inhabitants’ living quarters. If an electricity system is in place, Comet-ME can install water pumps connecting households to the existing cisterns, filter the water, and provide long term water quality monitoring. Most importantly, they train a member of the community to maintain the resources. Simry emphasized that the organization views the communities they work with as both partners and beneficiaries. The work that they do is not charity – while Comet-ME does not charge for the instillation of the infrastructure, individuals do pay their own energy bills. Simry explained that this ensures that the communities have a sense of ownership over the resources newly made available to them. The residents retain their self-dependence and pride. Area C of the West Bank is a land ridden with stark inequalities. Here, the tents and caves of Palestinian inhabitants find neighbors in Israeli settlements. Where the Palestinian communities usually lack basic utilities, the settlements are well equipped with the electricity, water, access roads, and other resources needed to live a modern lifestyle in a desert area. The different living realities are a result of the hostilities within the region. The Israeli-Palestinian conflict manifests itself in long-term aggressive action. The Israeli Civil Administration (ICA) controls building and infrastructure development in Area C. They mandate building permits for the construction of any facilities. It can sometimes take five years for any decision on the permit application to be released. Even then, the ICA often rejects the application. The ICA qualifies the Palestinian buildings as illegal even while their own settlements are illegal according to international law. At the same time, the Palestinian Authority is obligated to provide schools and health clinics to Palestinians living in the region. Continuous denial of building permits from the ICA has led them to construct these facilities without Israeli permission. Without permits, these buildings are often torn down. Subsequently, schools and health clinics that have successfully maintained operation in this region are sparse. Still, Palestinian communities persevere in these conditions in the name of holding onto ancestral lands. Many stay because departing from these areas would leave Area C, which makes up 60 percent of the West Bank, in full control of the Israeli settlements. Comet-ME has also experienced difficulty with building in the region. In June of 2017, Israeli authorities came to Jib al-Deeb, a community Comet-ME had been servicing, and cut the power lines to the solar panels generating the community’s energy. 96 solar panels and other expensive electronics were seized, and the community was left powerless for three months in the heat of summer. Three months later, Comet-ME managed to get the batteries returned and the photovoltaic system functioning again. Still, tensions between the community and the Israeli government remain. Comet-ME addresses many of these issues with legal battles. Comet-ME works with their international partners to prepare for such encounters. Their partners include governmental representatives from Germany, Ireland, the United Kingdom, and the Netherlands. When the microgrid system was stolen from Jib al-Deeb, it was with the help of these partners that Comet-ME was able to press their case and get the technology returned. Despite the difficulties faced in implementing their service, Comet-ME has succeeded in improving the lifestyles of many different communities. With access to energy, chores such as laundry, cooking, and churning butter have increased efficiency. The butter in particular is valuable as it is one of the primary products sold to support the Palestinians’ livelihood. Students can study after dark. With the services provided by Comet-ME, residents of the area gain not just utilities, but time, physical energy, and money. Comet-ME seeks to make available resources that would ease the lives of those that inhabit the zone of conflict between Israel and Palestine. As an organization that provides service to support those affected by political strife, Comet-ME seeks to empower the resilience of communities seeking to stay in their homeland.